2.Denial: Our next reaction is to deny the changes are going to happen " It´s not going to affect me"
3.Resistance: When we realize it isn’t going to go away we may start to resist " I really don’t want to deal with this"
Everyone needs to progress through all the stages I have described, whatever the degree of change being faced. 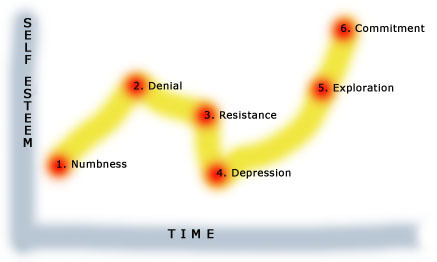 What does vary is how quickly you go through each stage and whether, at any point, you slip back to a previous stage. you firstly need to IDENTIFY WHERE you are now before determining HOW BEST to move yourself forward to the next stage. What are you feeling at the moment? Where are you on the changes curve right now? If you are stuck at particular stage, what needs to be resolved before you can move on again? Have A Great Story About This Diagram?